the paths that convey people, goods and information, are the same through which risks are propagated. High variability and uncertainty must be taken into account as constant operational factors and the understanding of phenomena emerging from complex system interactions requires models and tools that go beyond current practices based on a linear cause-effect modelling of system operations. 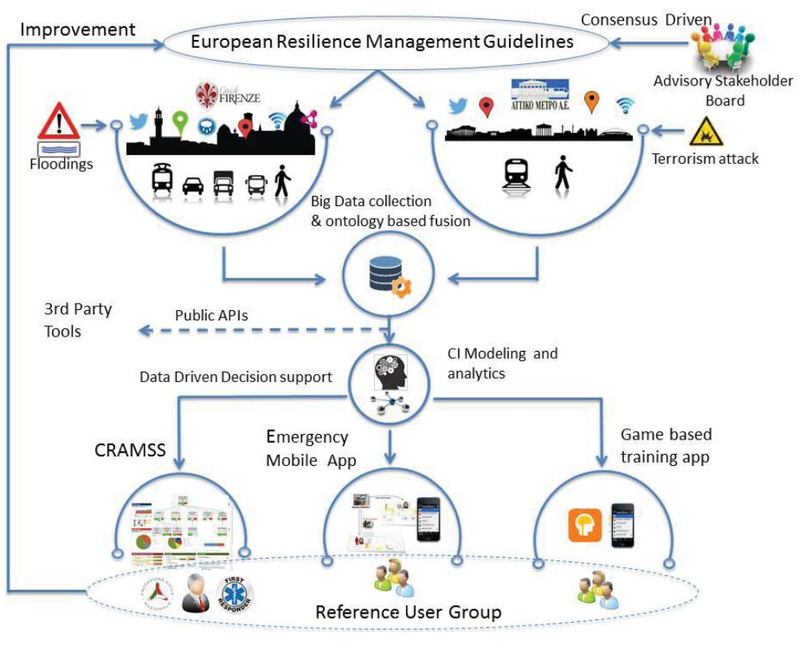 Taking into account these considerations, the RESOLUTE project aims at developing information and data management systems to provide improved support to systems operations under high variability and uncertainty conditions. Although UTS are used as specific case study, the development of overall valid resilience guidelines is one of the goal of RESOLUTE. RESOLUTE will define, develop and validate guidelines which will permit to operationalize the resilience concepts. With respect to this goal, it is important to highlight that operationalizing the concepts of resilience requires taking different time granularities into account, with respect to management of the critical infrastructure (short, medium and long term), as well as different “perspectives” (physical, service and cognitive level). Furthermore, approaches and tools for network/graph analysis and data analysis, have been also identified with the aim to model, analyze and simulate the behavior of a complex UTS and possible disruptive events.